Fresh baked breads, pastries, coffee drinks, cookies, European style tortes, a variety of bottled sauces and dressings, deli lunches fully prepared meals to go with gourmet cheeses, meats, wine, and more! 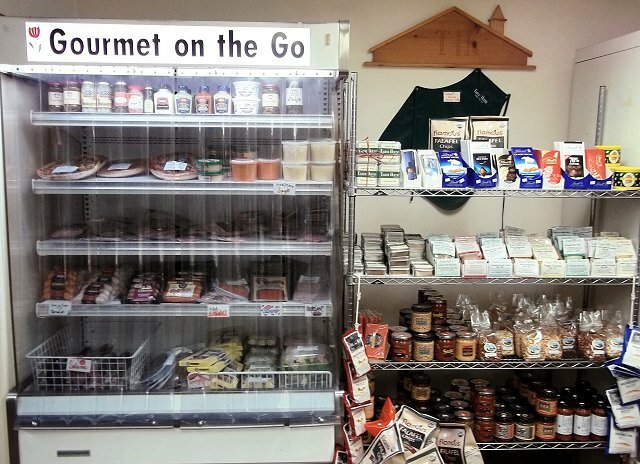 We have all kinds of gourmet foods for you holiday parties! Fondue Packets and fresh bread for dunking. Raclette Cheese and all the fixings. “While you sleep, we loaf.” We start baking our European-style breads and pastries each morning by 2am. We specialize in hand made European style (not so sweet) breakfast pastries, cakes and cookies. … It’s 4am. Do you know where your bagels are? We are locally famous for our coffee. Our Swiss coffee machines brew each cup to order. There’s something for everyone: lattes, mocha’s, cappuccino, and hot chocolate. No stale airport coffee here! We feature locally roasted Alpen Sierra Coffee which is also available for purchase by the pound. Don’t feel like cooking, but don’t want to go out? Pickup ready-made meals at the Tahoe House and heat them up at home! There is also a selection of seasonal deli salads available every day. Pesto Pasta Salad, Asian Style Veggie Orzo Salad and Southwestern Black bean salads are just a few examples. Homemade soups are available fresh or out of the freezer case. Fresh fish, ready to cook at home, is available on Friday and Saturdays. Call (530-583-1377) for this week’s offering. Gourmet sandwiches made on our fresh crusty bread. We use only the best quality meats and produce. See the menu inside. We have a sauce to please every palate. There are 32 choices, and counting! Peter and Barbara (the Tahoe House’s father-daughter professional chefs) worked together on special recipes and combinations that you can’t find anywhere else! All varieties are available in the store, Home and Garden Shows and via the Internet on our online store. We also stock many well known brands of gourmet food. Our specialty is hard to find ingredients!